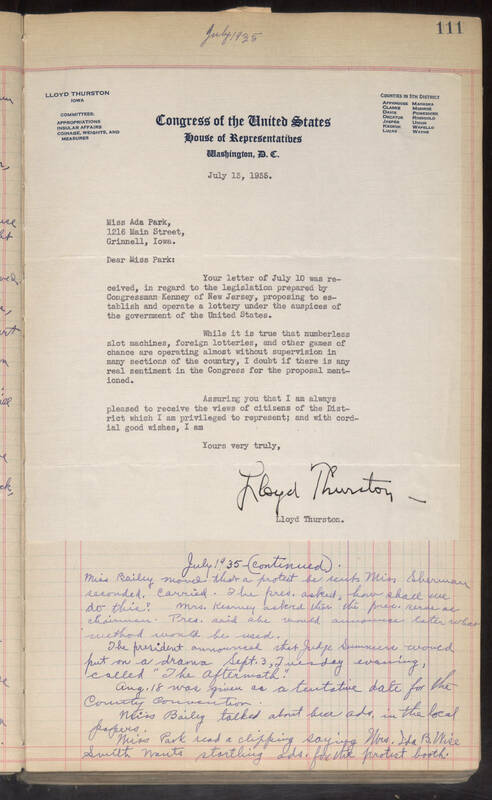 July 1935-(continued). Miss Bailey moved that a protest be sent. Miss Sherman seconded. Carried. The pres. asked, how shall we do this? Mrs. Kearney asked that the pres. serve as chairman. Pres. said she would announce later what method would be used. The president announced that Judge Summers would put on a drama Sept. 3, Tuesday evening, called "The Aftermath." Aug. 18 was given as a tentative date for the County Convention. Miss Bailey talked about beer adv. in the local papers. Miss Park read a clipping saying Mrs. Ida B. Wise Smith wants startling ads. for the protest booth.